I knew I had wanted to write this blog post for awhile. I also knew I wanted to be blatantly honest with myself while I wrote it. So deep breath in.... Here we go. My name is Alyssa, and I live in Kansas City Missouri. I have 25 years worth of beautiful memories in my rear view mirror, with plenty of stops ahead, (at least I hope!) But life isn't always easy. This blog post reflects so much more than a tshirt, but this tshirt is also much deeper than 100% cotton. Before I get into the brand, here's my 'story'. I have struggled many years with depression, I think we all have in some ways. Mine was always staring at me back in the mirror, my appearance. I hated that it affected me the way it did; but sure as the sun would rise & set, I woke up fixated on my thighs, or my nose that was bigger than I would have liked it to be, or my acne that I couldn't rid even though I had acquired those stubborn zits since my teen years. When was it going to be my turn to feel good about who was looking back at me in that mirror? What I had been forgetting all along though, was that I had stopped loving myself. Sounds crazy right? But it's true. Somewhere along the way, I had ripped myself apart to the point where I was forgetting to love anything about me. I wasn't allowing myself to grow into the woman I was meant to be. I was a half bloomed flower that I just stopped watering. So how do you change that mindset? I had gone years feeling this way, I wasn't sure how to fill such a hole. And if I'm honest, sometimes I still don't. One thing I've learned throughout this struggle, is to take it a day at a time. Would I like to be slimmer and toned? Absolutely! Realistically, Is that going to happen overnight? No. (No matter how hard I struggle through my run or jumping jacks. Some things take time). I've also learned that you have to take time for yourself. Go to a yoga class, spend some time walking around in Target, (oddly enough, target is a treat for me. To each their own! ), go get yourself a sonic slush. You deserve to treat yourself. Don't deny yourself of this small truth. Something else that has helped me tremendously is the brand So Worth Loving. They remind me it's not about where I've been, what my past is, but it's truly a daily reminder to love ME . Because you know what? We're worth that. 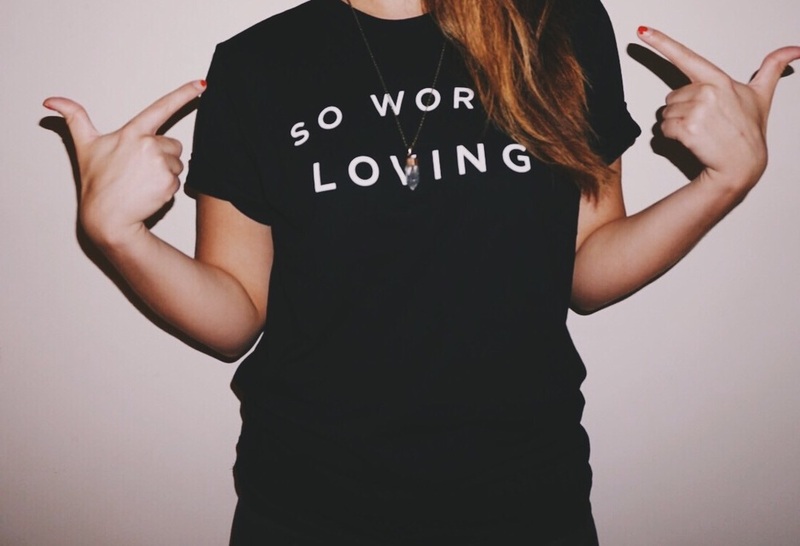 We are worth loving. We are more than our mistakes. We're more than our weight on the scale, than the nose on our face or the freckles we hate and try to cover up. We are worthy of so much more than what we can physically see. I encourage you, if you're struggling like I am, to follow them on Instagram . I'm lifted up daily by their posts, and as silly as it seems it's helped me tremendously. I hope this post finds someone somewhere who is struggling just like me, and I hope you know we're going to be okay. We've got this! And I've got so much love for all of you!